My intended adventure in the new boat was stymied by cold, rainy, windy, weather. 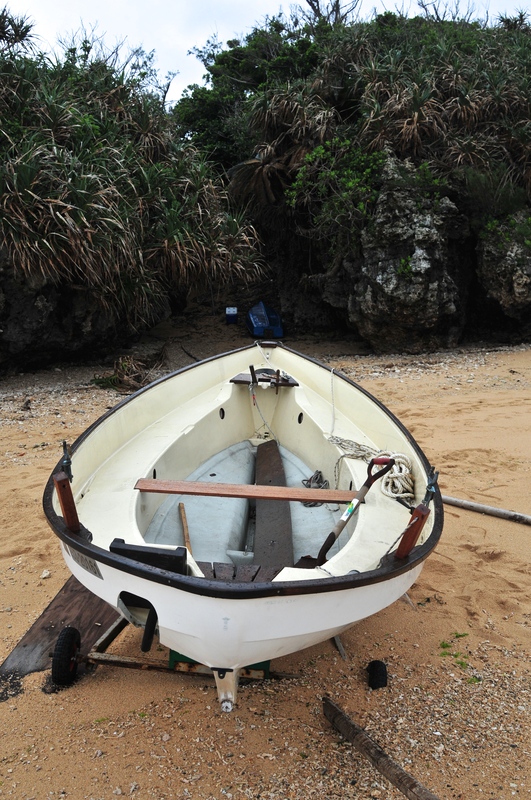 However I profit from the opportunity to take the boat out of the water to repair the various blemishes she suffered when washed up on the beach. How to drag her out of the water? Well, this is something I have been thinking about for the last couple of months. I need to get the boat into safety if bad weather blows in. I need to be able to do it without assembling a football team of helpers. So, I bury a pole deep in the sand at the top of Dead Man’s Gulch. I buy a portable winch that runs off a 12 volt car battery. I repair the nasty little trailer that the boat arrived on, putting on new wheels. I have grave doubts about these wheels as they are small diametrically and I fear they will sink into the sand. Satisfactorily? Well, sort of; I need another person to guide the trailer and place boards under the wheels. Thank you David. One wheel digs into the sand and concurrently the battery runs out of er, you know, stuff. When the power ran out. Notice buried wheel. Good looking boat! No worries. 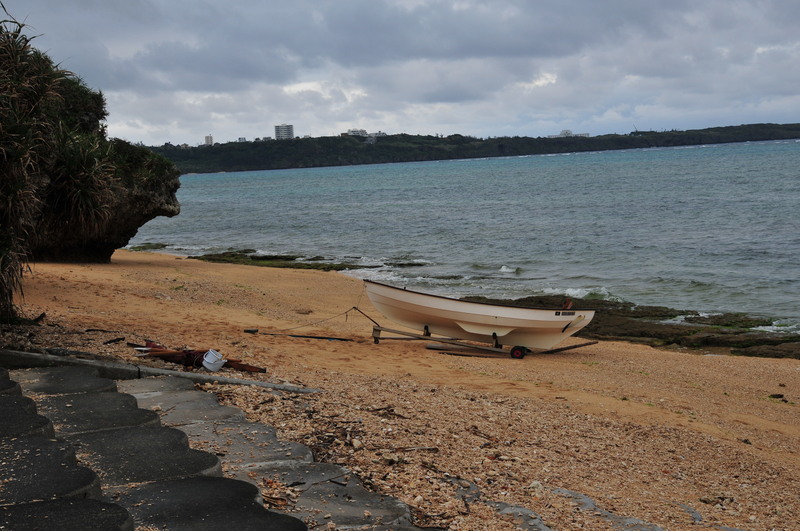 I take the battery home to recharge and lie in the drizzle and rain, repairing the boat. Dior does a very good line of boat repair products. 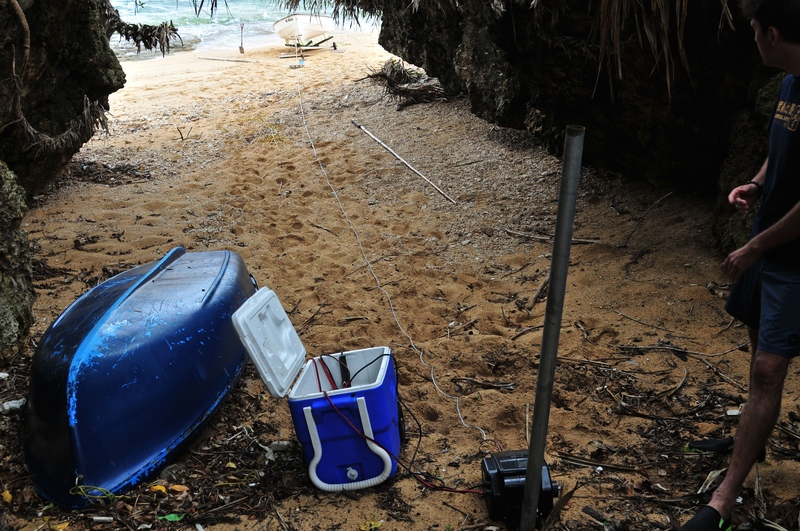 Next morning I sally forth with charged battery, looking forward to dragging the boat a bit further up the beach. 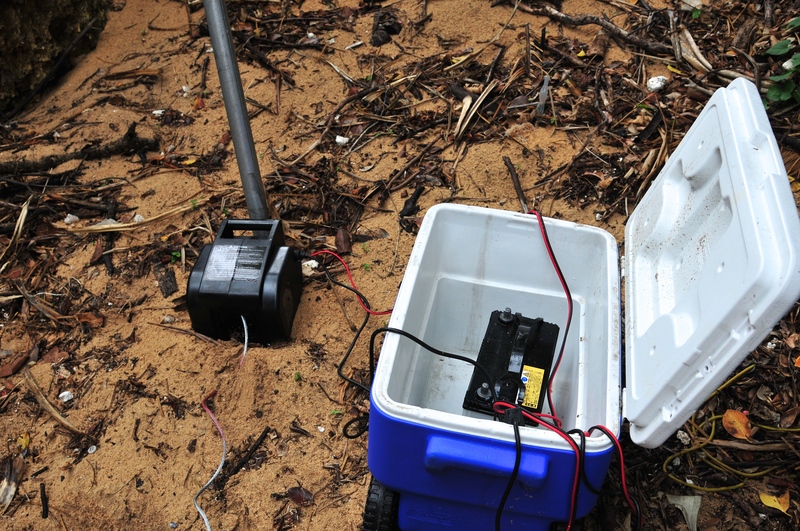 I place the battery in the cooler near the winch and start to pull out the metal winch cable. Somehow the cable gets coiled and flips over. Miraculously, it lands on both terminals of the battery. How could the winch cable get in there? Flash, sizzle, melt! I do not know what to do really as grabbing the cable would probably result in extreme pain. I watch it all sizzle for a while and then kick the cable off the terminals. The upshot is the winch no longer works. Schadenfreude – a guilty pleasure. I see that eBay lists 10 inch Sand Hopper trolley wheels for 11.63 pounds. A Tirfor winch might be a good investment – less to go wrong. Yes, definitely get a Tirfor but tracking one down in Japan is proving troublesome. The trailer was homemade and the axles are non standard size. Tracking down wheels with the right bearing size in Japan has proved troublesome. I think I might revert to rollers.